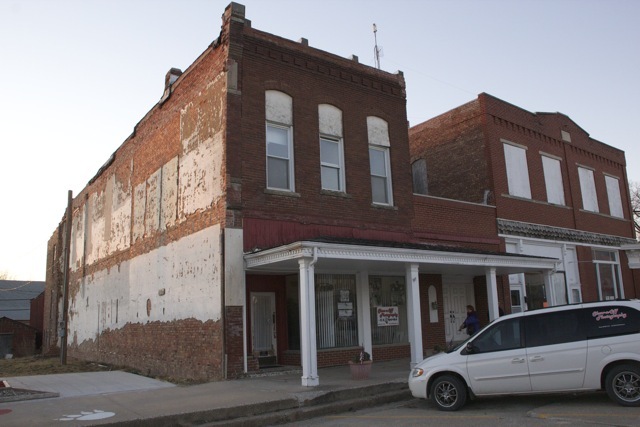 The Organizational Meeting of the American Passenger Heritage Foundation began Tuesday, February 19, 2013, at the Depot Inn & Suites 1245 N. Brown St. La Plata, MO 63549. 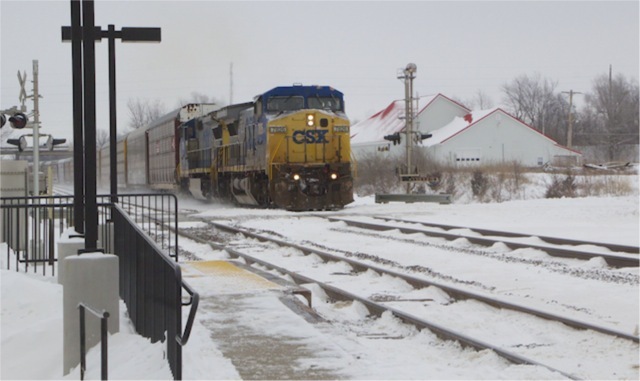 Several members of the group arrived on the morning Amtrak Southwest Chief Train No. 4 from Southern California. Arriving attendees and their luggage were shuttled to the Depot Inn & Suites, (a mere 5 minute ride) room keys were distributed, and the guests checked into their rooms. Attendees could have arrived by airplane as well. The Kirksville Airport just north up Hwy. 63 a few minutes has daily flights from St. Louis. 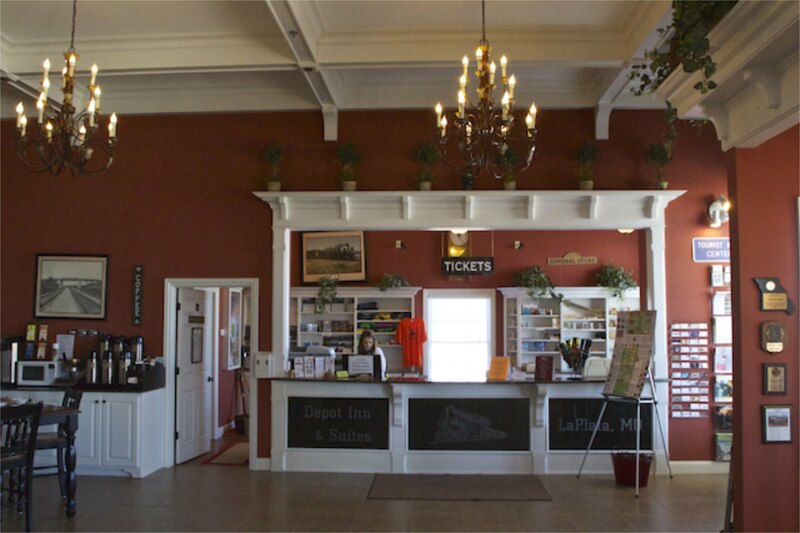 In fact, La Plata, Missouri, is the only town in the county to have both an Amtrak Depot and a nearby Airport providing easy access to the Depot Inn & Suites. 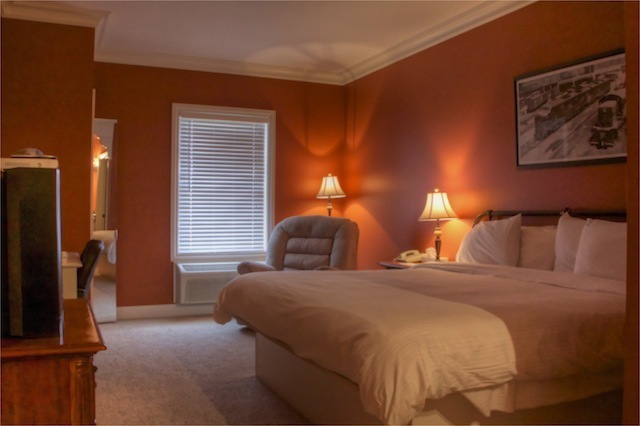 It was crisp and clear when we arrived, but our rooms were ready, warm, and inviting. 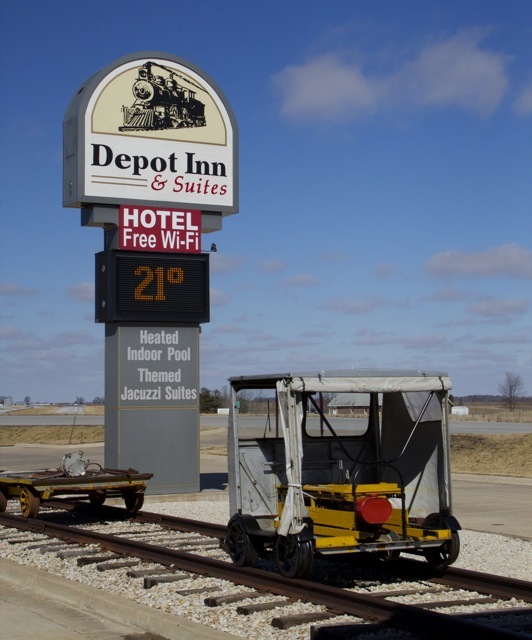 The two former Express Mail Cars behind the Depot Inn & Suites are both used to house the Exhibition of Amtrak History. 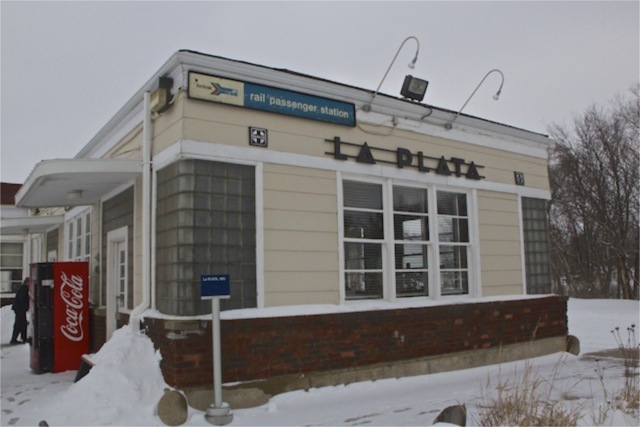 Each car has a separate, accessible entrance. 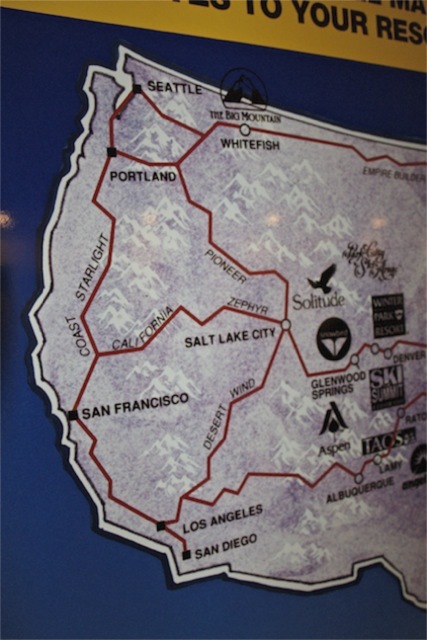 This poster shows both the Pioneer and Desert Wind routes that no longer exist. 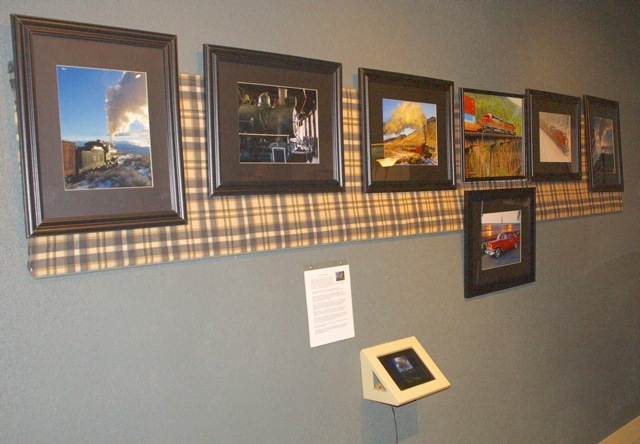 The cases are filled with donated Amtrak items, many of which were gifts to passengers who had a bedroom on various named trains. 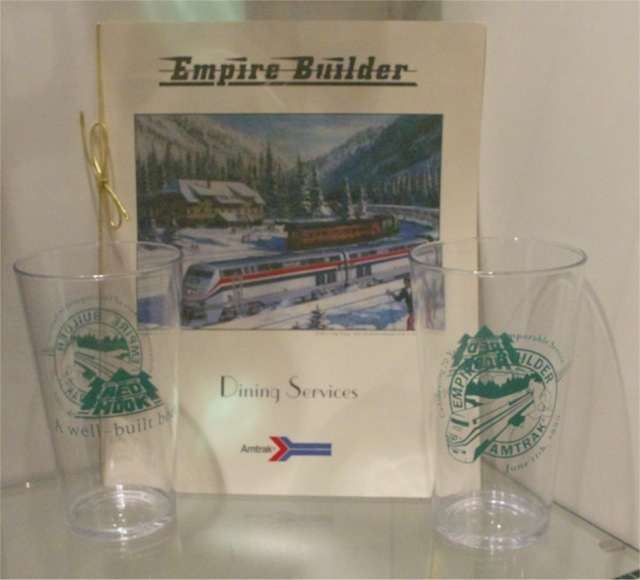 The menu on the Empire Builder had a painting of the Izaak Walton Inn in Glacier National Park where I've stayed many times. 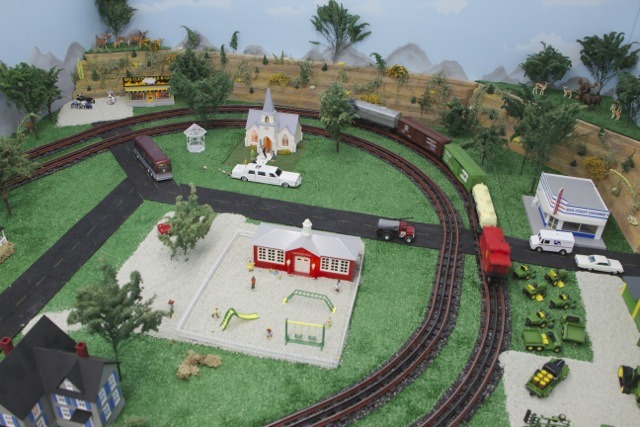 One half of the northern-most express mail car is devoted to an excellent, interactive O-gauge layout. 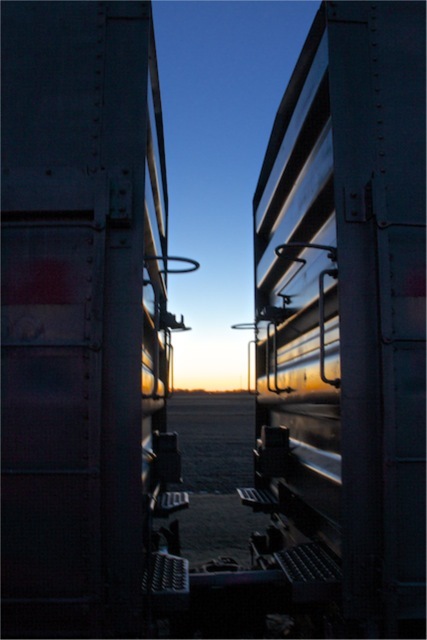 As we finished our tour of the Exhibition of Amtrak History and walked back into the Depot Inn, I liked the sunset light coming in between the cars. 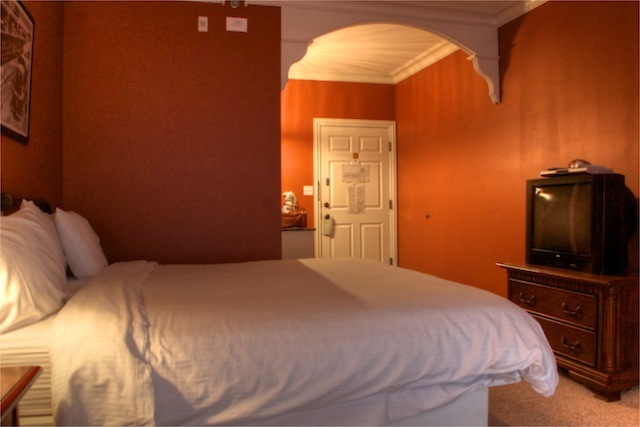 Following the APRHF Venue Tour, we reconvened for a meeting at the Depot Inn & Suites from 7 to 9 pm. Stephen Grande gave opening remarks welcoming the attendees from as far away as Pennsylvania and California as well as the APRHF officers some of which live in La Plata. Bob Cox gave a video presentation and an Open Discussion took place concerning APRHF's current and future plans, thus bringing all attendees up to speed on the APRHF. 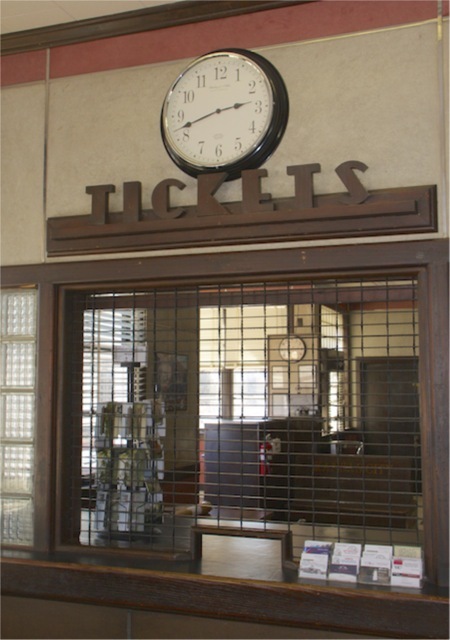 Behind the Ticket window would have been the ticket agent's office. 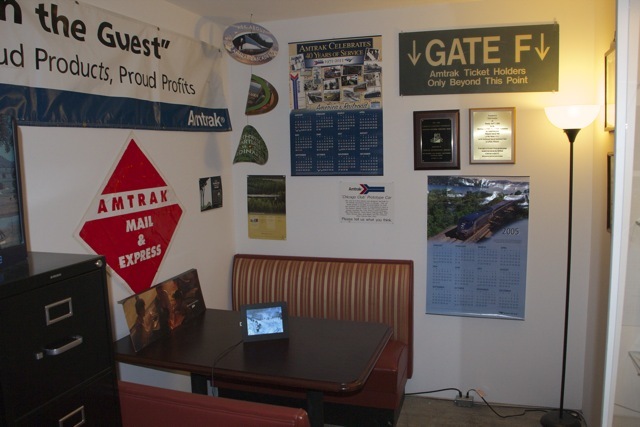 Since this is not an Amtrak Office any more, Bob Cox, part-time caretaker of the station, has his office here. This is not a public area for Passengers, but since we were being given a tour by the President of the APRHF, we were invited in. Joyce Manning immediately nicknamed the office, "First Class Lounge". 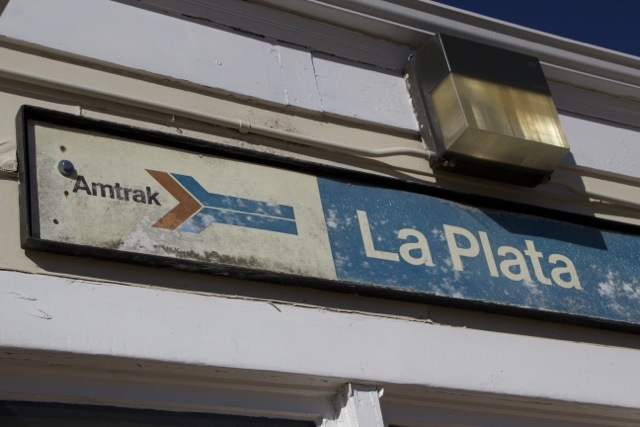 I guess since we all arrived by Amtrak with room accommodations, we qualified to enter which is true in both the Chicago and Washington, DC Stations. A new addition since I had been here in October was a bench labeled, "Liberal" on one side (above). I could not imagine that this was a political term, but took advantage of it anyway. 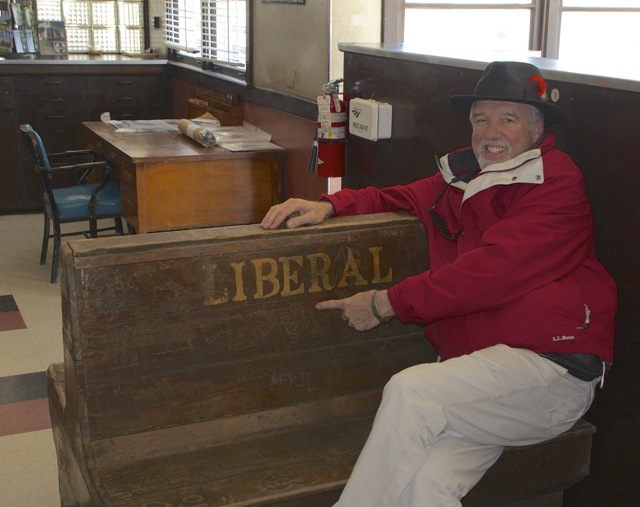 As it turned out "Liberal" was a station stop in western Missouri. 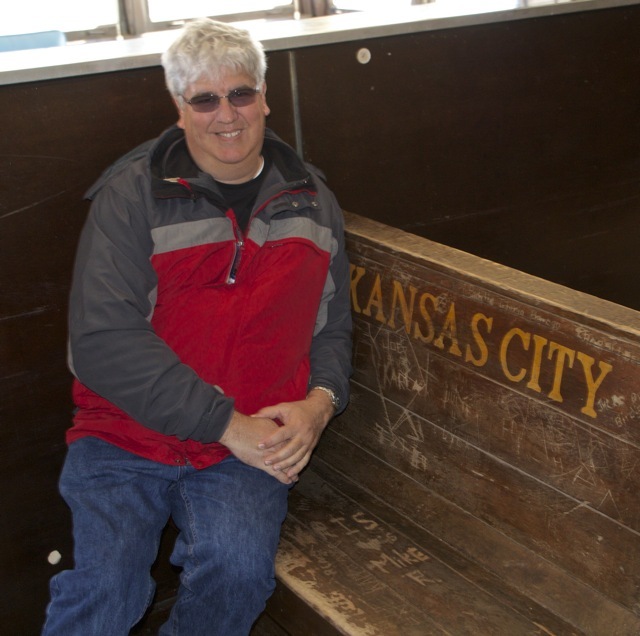 The opposite side said, "Kansas City" and Tom took that seat for a photo (below). 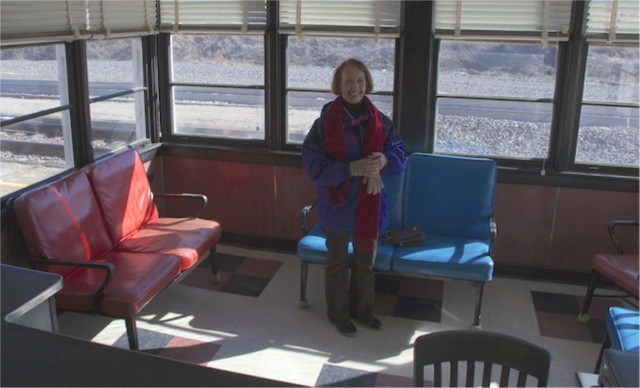 Joyce Manning enjoying the warm, trackside La Plata, Missouri, "Amtrak First Class Lounge". 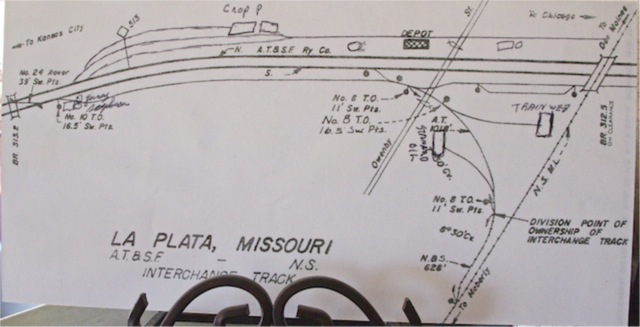 Bob Cox has this original schematic of the tracks, including the Wabash bridge in the upper right. 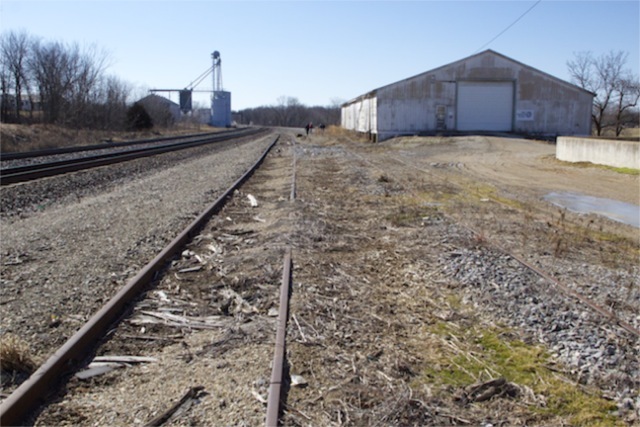 Nowadays the Wabash line and bridge have been removed and all the sidings except the one that used to go on the north side of the depot. That siding's switch is still on the mainline, and this is what we wanted to look at as being used for a future siding onto the Silver Rails Country/APRHF property. 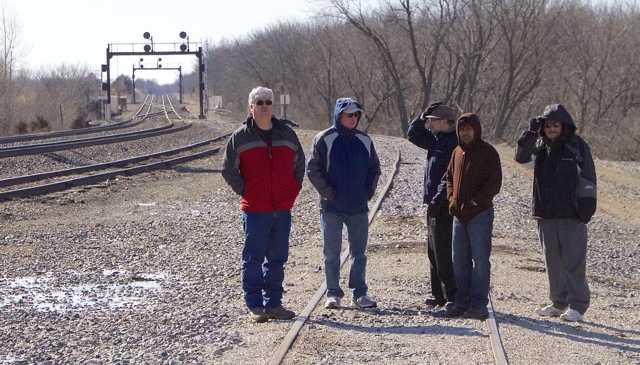 A secondary reason for visiting the Station was so the APRHF group could walk west of the station to see the siding that may be used in the future for private rail cars or container cars to be moved off the main line onto Silver Rails/APRHF property. 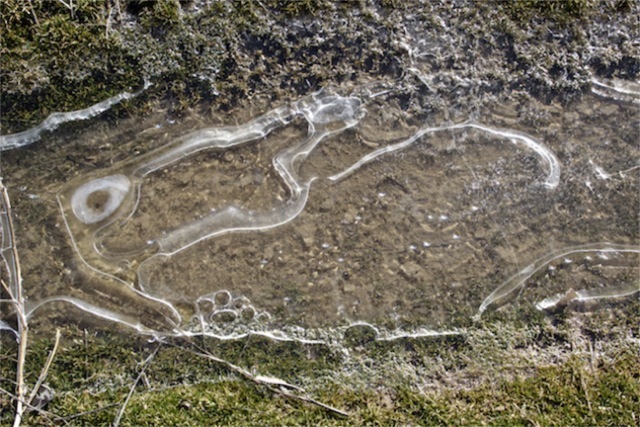 The ice that we stepped over (above) looked to me like an outline of a bunny. We proceeded down the long siding, west of the station, past the MFA building on the right, to the switch which is at the turn in the tracks. Inspecting the switch and side tracks with a view westward. 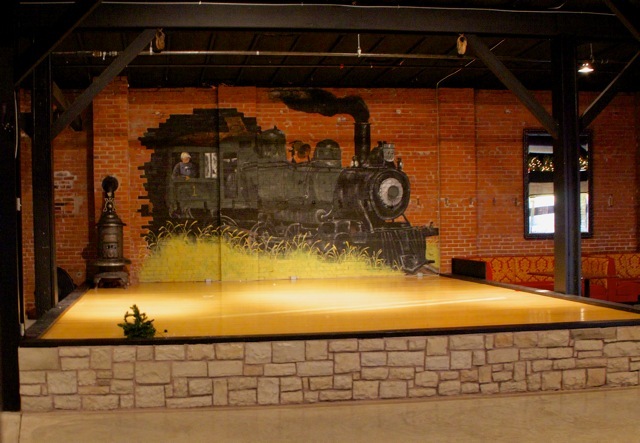 TrainWeb.com and TrainParty.com are both housed in the red-roofed building on the right side of the image above. 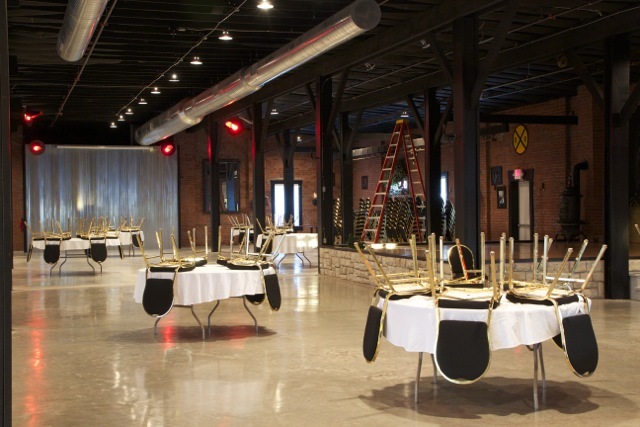 This photo was taken from the Amtrak Station, so you can see how close the APRHF venues are to each other. 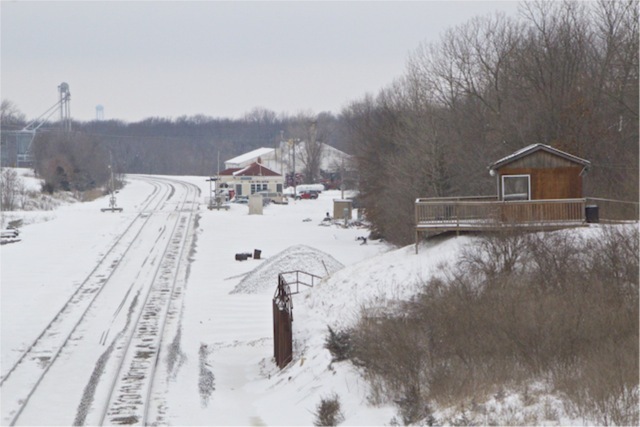 We were unable to get to the Overlook this trip (upper left in the photo above) because the road had been plowed shut with snow, but the Overlook is also an American Passenger Rail Heritage Foundation Venue. The Overlook is positioned on the old Wabash Right of Way bridge abutment over the Santa Fe Mainline. The bridge has been removed to accommodate doublestack trains. Telephoto image above was taken from the Santa Fe Station. Photo of the Overlook image below was taken from the Brown Street Bridge. 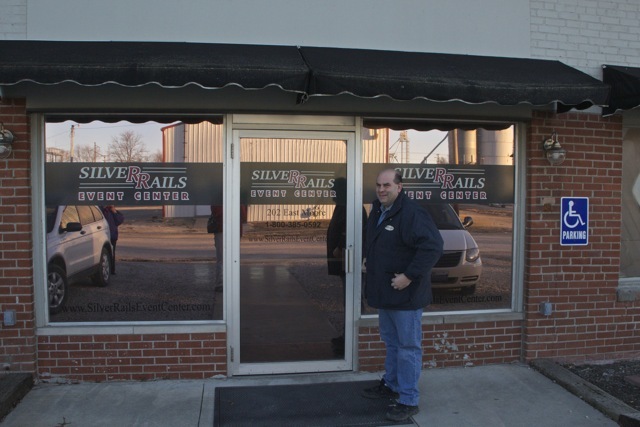 Although the Amish Stores are not APRHF Venues, they are on the Silver Rails Country Map. 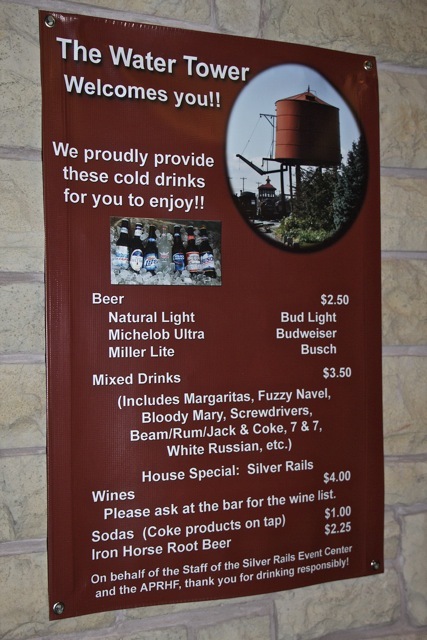 Their establishments certainly are worth the short time required to drive west of La Plata on Hwy. 156 to see them. Beware, however that some of these businesses are closed on Thursdays and all are closed on Sundays. 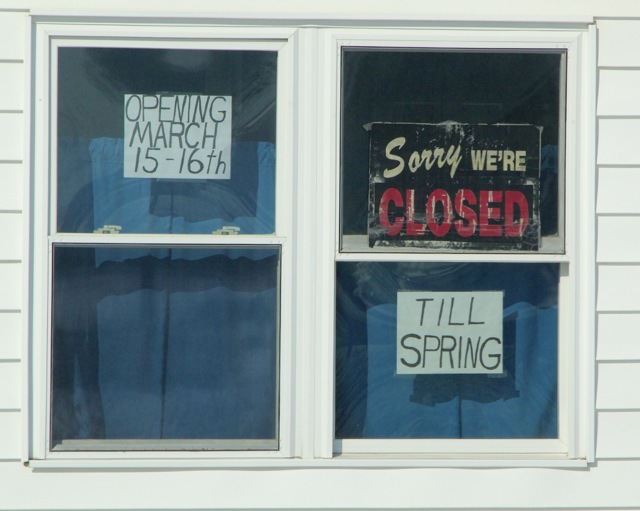 Some are closed for winter. If you can plan to drive out there on a Saturday, you will see more buggies because this is their traditional shopping day. 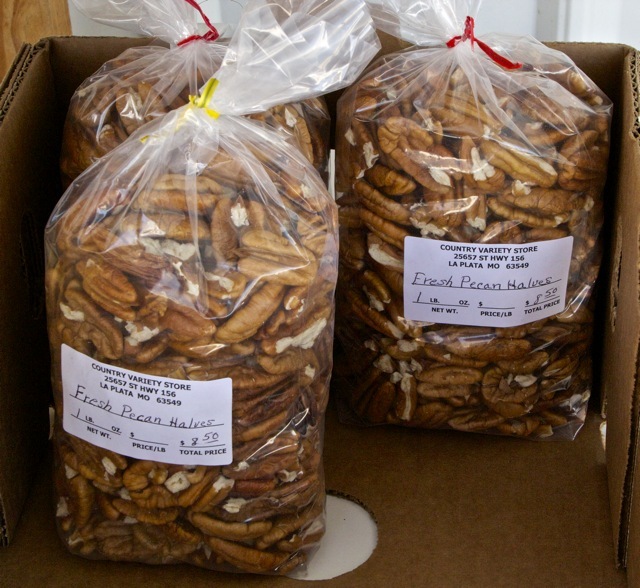 My favorite candy, cashew brittle, is available at the drygoods store. All the Amish Stores are on the north (right) side of the Hwy. 156 driving west of La Plata. Drive slowly over the crests of the hills because a pedestrian, horse and rider, or buggy may be on the road ahead of you. 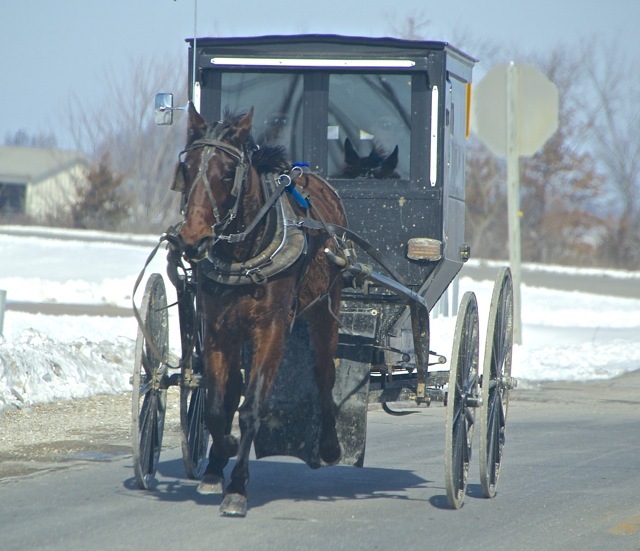 Missouri has not provided a separate lane for the Amish as I have observed in Amish areas of other states. 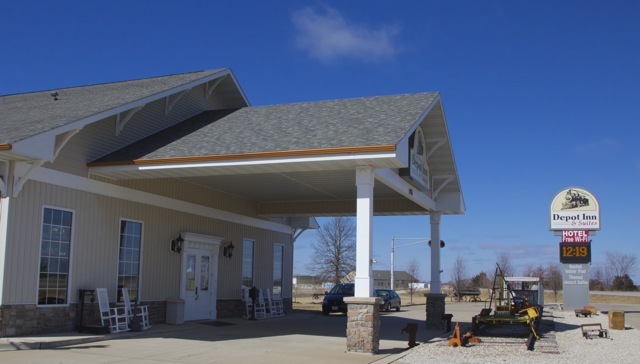 The first establishments you will come to are the Bakery, Farrier Service and Feed Store, all on the same property. 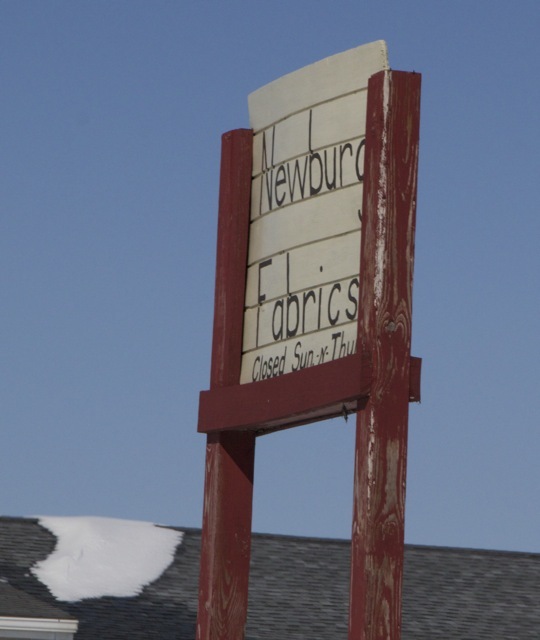 For the Bakery, Farrier Service and Feed Store, you may want to look for the red building instead of the sign since the building is more noticeable. I met Sam Mast here again on this trip. He now owns a top buggy pulled by his horse Alan. The last time I saw him he gave me a ride in his open buggy. That was in October, 2012, and I will put a link at the bottom of this page to that ride. 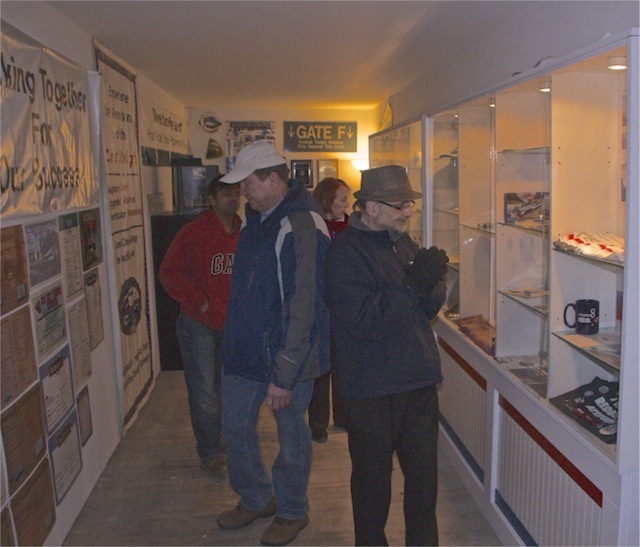 Sam and his wife, Mary, were working the food stand at the APRHF Train Show at the Event Center at that time. 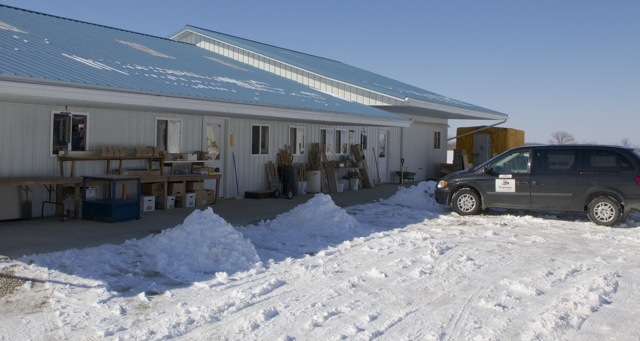 The Feed Store is just to the right of the bakery. 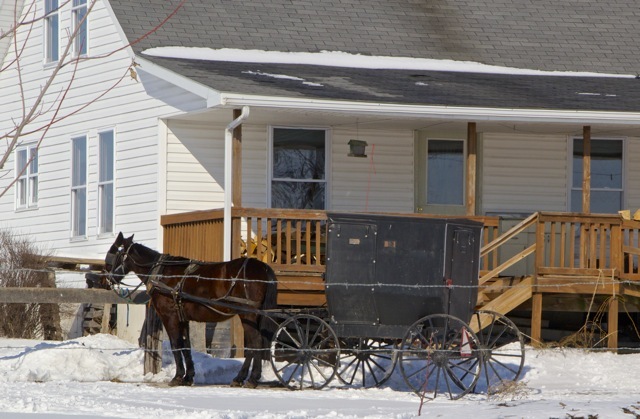 The Fabric Store was closed, but the residence next door had a buggy outside. The Drygoods Store was open. 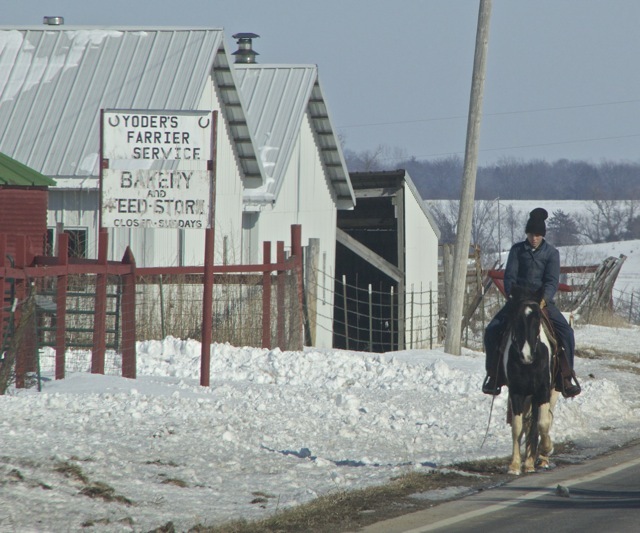 Ben Myers, who is from the Elizabethtown, Pennsylvania area where Amish live, lead the way into the Drygoods Store. 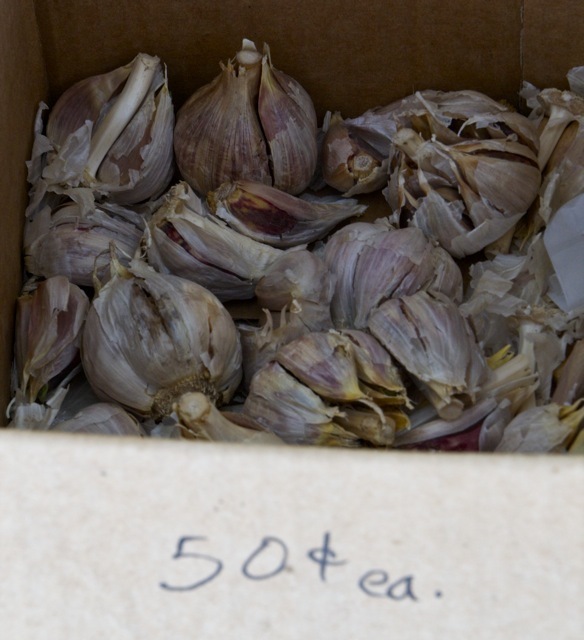 Since it was below freezing, the garlic and nut meats stored outside were not harmed by being frozen. 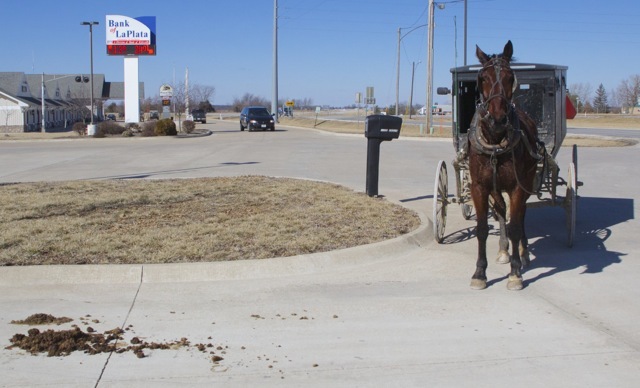 The Amish do come into La Plata to make 'deposits' at the Bank of La Plata. I wonder whose responsibility it is to pick up road apples, evidently not the Horse nor Driver. Click here for a Slideshow of Photos from This Section of this report. 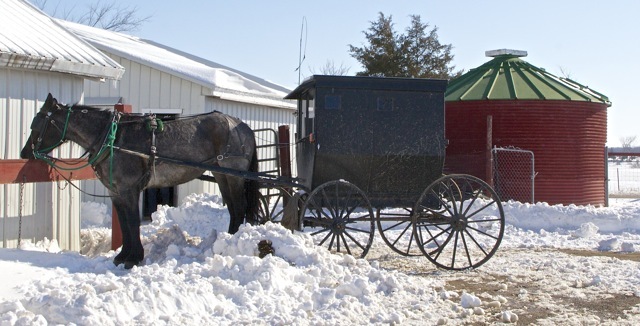 My October Visit to La Plata when Sam Mast gave me my first Amish buggy ride, powerd by his horse, Alan.